Dry roast the Red chillies,Coriender seeds, cumin, Chana dal,Black gram dal,Onion and the garlic. Grind roasted spices with grated Coconut and Tamerind juice into thick paste( chatney consistancy) add salt to taste. Slice the Eggplants vertically from the top,turn half way around and slice again without separating form the hull. Stuff the Eggplants with masala. Heat the Oil in a heavey pan, add Mustard seeds, Asafoetida and Termeric powder. 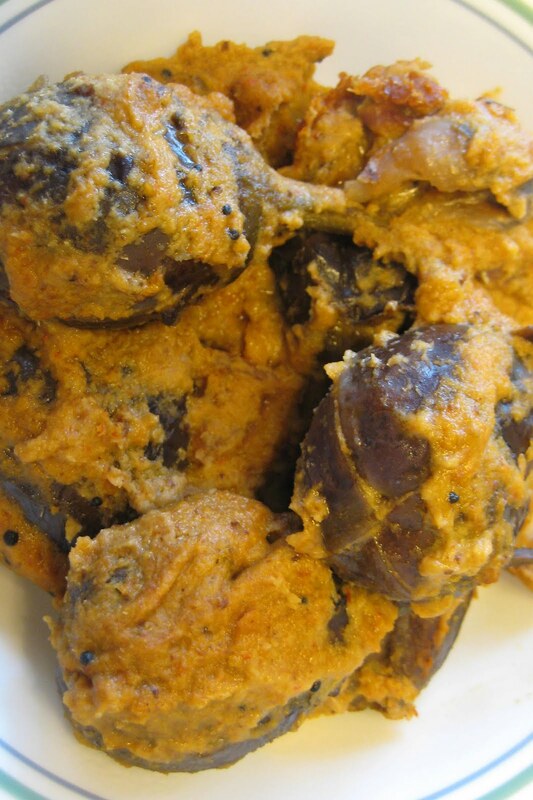 Then put Stuffed Eggplants.Fry them for 5-6 min, then add remaining masala.Add little water if necessory.Adjust the salt to taste. Cover and cook until Eggplants are soft on medium heat. oh howda next time madvaga shenga haaki try madthe.thank you..